Finally picked up a DVD copy of the original Bedazzled (1967)… the VHS copy I’d recorded from TV had terribly unsound sound quality! Oddly, I was looking for the American remake when I found it, and, at five pounds, it was just too great a bargain to resist. Personally I quite enjoy the remake, and think the cast do a fantastic job of switching between their various characters… Liz Hurley rather lets the side down, but other than that the performances are top-notch. I don’t think the two films bare much relation to one another, but I don’t think they’re mutually exclusive either… of course, I’m likely to say that Peter Cook‘s version is the best, because it was the original and because it’s so very English, which tickles a tiny nub of comedy-patriotism deep within my soul… but laugh-for-laugh, they’re near enough equal in my eyes. The music is better in the original though, and I often listen to the title song… full credit to Dudley Moore‘s composing, and to Cook’s delivery! I’d love to hear a Black Box Recorder cover version someday, but sadly lack the sway to make such things happen. 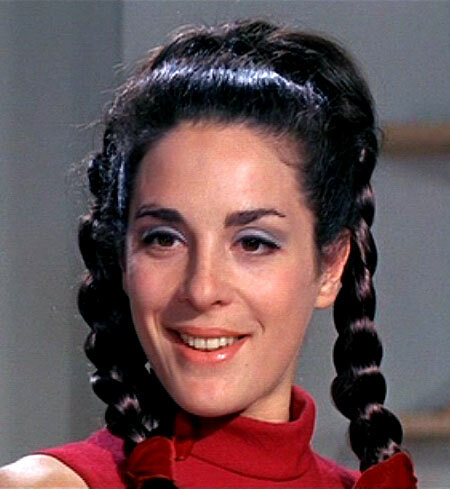 It’s always good to see Eleanor Bron as well, and watching the film again reminded me how odd her character’s hair and make-up seemed to a young lad born in the late Seventies. She wears some very peculiar “retro” styles throughout the film, but I rather dig them now… especially the green plait. I also have this whole obsession with eyebrows, which we needn’t go into here, except to say that Bron’s score top marks. I also admire how much she commits to the roles she plays… being the “object of desire” isn’t always the most rewarding part for an actress, but she really puts her heart and soul into it. While Cook and Moore play it slightly broader, she keeps things grounded, I think. The direction is also fantastic… which rather undermines my “comedy-patriotism” angle, since I believe Stanley Donen (producer/director) is American. Clearly the best man for the job though, because it’s such a gorgeous-looking film. Obviously, as a writer myself, I think that a decent script is the backbone of any comedy, along with the performances… as many sitcoms and stage-plays have proven over the years, it’s perfectly possible to create an engaging and complete comedic universe with little more than two actors and a chair… but the aesthete in me loves to see those fundamentals augmented and enhanced with inventive set-design, costumes and photography. Comedy has to sound right to the ear, but it’s even more pleasing when it also feeds the eye! This entry was posted in Rants about Films and tagged Bedazzled, Dudley Moore, Eleanor Bron, Liz Hurley, Margaret Spencer, Peter Cook, Stanley Donen. Bookmark the permalink.